Installing baseboard trim provides functionality and improved home appearance. Baseboard trim serves as a transition point between walls and floors, as well as protects the base of the walls from scuff marks caused by shoes, furniture and other objects. Installed improperly baseboard trim can separate from the walls and have ugly looking joints. This said, installing baseboard trim doesn’t need to be left to the pros. With a little upfront carpentry knowledge and the right tools you can install your own baseboard trim and achieve a quality job. The instructions provided in this “Installing Baseboard Trim Ebook” will quickly provide you with the skills and knowledge you’ll need to install baseboard trim in a room, and achieve that professional look. Learn the secrets to achieving a quality baseboard trim installation, without the high costs of hiring a finish carpenter! 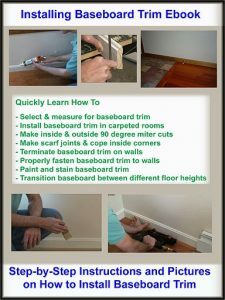 My 18 page “Installing Baseboard Trim” Ebook provides step by step instructions on how to install baseboard trim properly. In less than 60 minutes you will fully understand what you need to do to properly install baseboard trim. Order Now and Immediately Download the Installing Baseboard Trim EBook today! The Installing Baseboard Trim EBook costs only $15 and is 100% guaranteed. Learn how to Install Baseboard Trim Like the Pros! Don’t Waste a Fortune on Scrap Baseboard Trim! 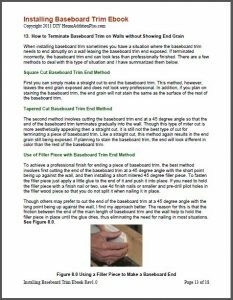 The “Installing Baseboard Trim EBook” provides easy to understand, step-by-step instructions, on how to install standard 3-1/2 inch wide baseboard trim in a room containing both inside and outside corners. In addition, it discusses the common baseboard trim styles, sizes, and material types, and shows how to save time in the finishing process. It also explains how to properly use a miter saw and coping saw to achieve perfect joints like the pros. Learn How to Install Baseboard Trim the Right Way! !